My teacher, Udaka Michishige is the descendant of the Udaka Clan, serving the Matsudaira lords in Matsuyama from 1712 until the beginning of the Meiji period, when the clan disbanded as a consequence of the upheavals of the Meiji restoration. Having the desire to restore the connection with his ancestors, Udaka-sensei has established a practice group in Matsuyama, where he eventually built a shiki-butai, a personal training space, in 1997. Udaka-sensei has been performing regularly in Matsuyama in various events, including the Shinonome Noh and the Matsuyama Shimin Noh. In addition, Udaka-sensei has been collaborating with the Matsuyama Shinonome shrine cataloguing and restoring the vast Noh masks and costumes collection. This year’s performance for the Matsuyama Shimin Noh series will be Sesshōseki (‘The Death Rock’), centring on the figure of Tamamo-no-mae, the beautiful and lethal courtesan serving the Emperor Konoe (1139-1155), in reality an evil fox-spirit in disguise. In Sesshōseki a travelling monk meets the spirit of Tamamo-no-mae, now imprisoned in a rock that kills everything that touches it. Thanks to the mystic powers of the monk, Tamamo-no-mae is subdued. 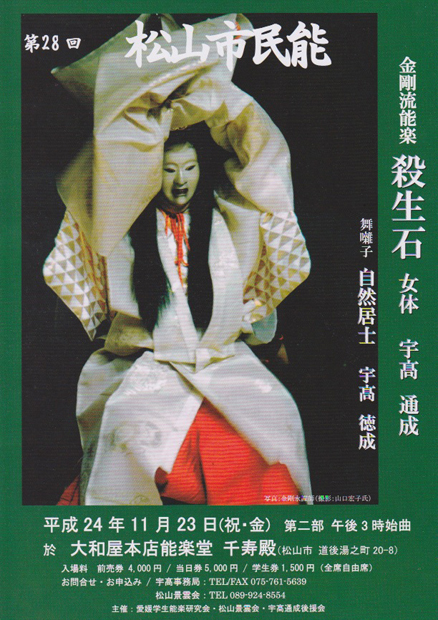 The ‘nyotai’ variation of Sesshōseki, which Udaka-sensei will perform on November 23rd in Matsuyama, features a different idetachi (costume, mask, wig set-up) for the shite, who appears as a more ‘feminine’ character instead of the usual demonic or beastly shape. The performance will be preceded by a recital of su-utai and shimai by Udaka-sensei’s students – will write more about this soon. Matsuyama Dogo Yamatoya Nohgakudo 10:00 a.m.~5:00 p.m.